There's so much to say about Hyland's. Most of it centers around you. Our work, our research, and the development of our products -- they are all informed by your needs and feedback. So when it comes to telling you about us, it’s really telling the story of our magnificent family – which includes the great people we serve. So we’d like to start this ‘about’ section by thanking you for defining who we are. Hyland’s is celebrating over a century-long commitment to making safe and natural homeopathic medicines. During all these years, we’ve never lost touch with the reasons why our founders started this company – beginning with the pharmacist and visionary George Hyland back in 1903. We have always been driven by the simple scientific proof of how the body can call upon its own natural defenses to heal and restore balance. This is the basis of homeopathic medicine. So even during times when cultural and political factors have pushed homeopathic medicine from the mainstream, Hyland’s has solidly stood its ground with integrity and wisdom, knowing that as sure as the sun rises each day, our medicines are effective, virtually free of side effects and able to be taken by nearly anyone at any time, from infants to the elderly. Today, as countless conventional medicines developed by others prove to produce complicated or even harmful side effects, the need for natural homeopathic medicines that work without side effects is increasing. Hyland’s stands as a leader in innovations that answer to the changing health needs of our modern world. From master athletes who use our Arnica Gel on their 3000 mile adventures, to toddlers who can’t yet walk but have the capacity to send their parents running to fetch our Teething Tablets – Hyland’s medicines share the milestones of people’s lives. We’re there when legs are needing a rest, when aching ears need drops, when noses need unclogging, and when little bugs in the hair become big problems for everyone. Hyland’s is for all ages at all times. It’s an honor to play a role in your lives and we’re grateful for your trust and interest in who we are. Don’t even think about another bad night’s sleep. Your body is built to rest. Calms Forté® uses four homeopathically-prepared botanicals to ease your body and your mind, plus six minerals to soothe nerves and edginess. There are no sedatives, so no next-morning drug hangovers. This natural and safe sleeping aid has helped people get their much needed ‘zees’ for over 50 years. 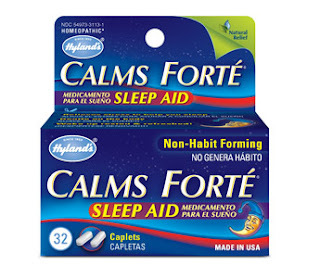 Hyland's Calms Forté helps me sleep naturally. I love that it's all natural and you don't wake up with that heavy feeling in the morning. It calms my nerves and helps me relax to drift asleep peacefully. If I wake at night I'm able to drift back to sleep within minutes. I no longer lay in bed for hours trying to go back to sleep only to still be awake when the sun comes up. I also love that Hyland's Calms Forté makes for a great day the next morning because I'm rested and my nerves are calmed. I highly recommend this product to anyone who needs help sleeping at night. Frazzled nerves can steal away your balance and make everyday activities feel like marathons. Hyland's Nerve Tonic® helps your body handle the stress of everyday life. * Available in small, quick dissolving tablets and caplets, Hyland's Nerve Tonic® is your answer to stress and nervous tension. So don’t worry anymore. We’ve got it handled! 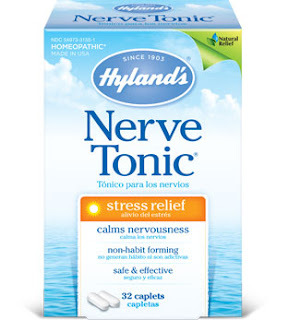 Hyland's Nerve Tonic is the perfect way to relieve stress naturally. Some days I just feel so stressed and overwhelmed but when I take Hyland's Nerve Tonic I feel calm and relaxed within minutes. I love that this helps me to deal with stress and is made of all natural ingredients. I also love that Hyland's Nerve Tonic is non habit forming so I can take it when I feel like I need it and go without on days when my stress levels are low. Follow Hyland's on social media! I often have trouble sleeping - this might be worth trying. I will look for it. I do not take medicine very much, but this sounds interesting and I know Hyland is a good brand. I will be on the lookout, maybe I can try it on the mister---he needs the sleep. lol! I have used Hylands brand forEVER now! I love their brands and their products. What!? Why have I never heard of this Nerve Tonic?? I'll definitely be trying it once I'm done nursing my son. A natural, non-habit forming way to ease anxiety? I need this. My husband has been struggling to sleep recently due to stress. I should recommend this to him, thanks!